Imphal, December 01 2011: The World AIDS Day was observed in different parts of the state by various organizations including a grand state level observance organized by the Manipur State AIDS Control Society (MACS) at 1st Battalion Manipur Rifles today. The State Level observance of the World AIDS Day 2011 held under the theme "Getting to Zero - Zero HIV Infections. Zero Discrimination and Zero AIDS realted deaths" was graced by the Governor of Manipur, Gurbachan Jagat and Chief Minister O Ibobi as the Chief Guest and President respectively. Health Minister L Jayentakumar and Education Minister DD Thaisii were the Guest of Honours. The Governor, on the occasion officially launched the Early Infant Diagnosis (EID) programme, two ART Centres, one each in Senapati and Bishnupur and two Link ART Centres at Kumbi and Sagolmang and an Oral Substitution Therapy (OST) programme in Government sectors in Tamenglong. Later the Chief Guest also flagged-off "Mission Against AIDS" in the five Hill districts of the state including Jiribam. A Souvenir was also released on the occasion by the Governor. Speaking on the occasion Governor Gurbachan Jagat said that the World AIDS Day is a very important event across the world- particularly in the state of Manipur, where the people have experienced the impact of HIV epidemic for the last 20 years. Many people have died and a number of children have been made orphans and young women widows due to the epidemic. He further expressed concern over the incidence of innocent pregnant housewives being infected by HIV and AIDS and said that the magnitude of the problem in the state is very alarming, where 0.5% of them are estimated to be living with HIV and AIDS and appealed for promotion of voluntary HIV testing before marriage. 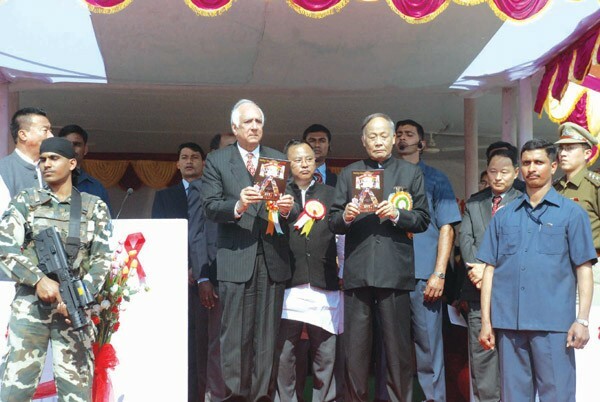 "It is very unfortunate that Manipur is identified as one of the six high HIV prevalence states in India by the National AIDS Control Organisation (NACO), Ministry of Health and Family Welfare, Government of India", he said. He further went on to say that infection among the mothers indicate possible infection among the new born children. If new born babies are infected, the future of Manipur will not be bright. Children should be getting the utmost care and protection in this regard and it is the responsibility of the society at large, particularly the women to have a greater involvement in the fight against HIV and AIDS to safeguard the future of Manipur. He also expressed happiness at the official launching of Early Infant Diagnosis programme in the state and said that the programme will help in reducing 76% morbidity among infants on early Ante-retroviral Treatment and 75% reduction in the infant mortality on early ART. Earlier an infant born to a HIV infected mother had to wait the attainment of 18 months for accurate diagnosis. But now a baby born out of an HIV positive mother can undergo HIV testing from 6 months onwards till 18 months of age free of cost at selected ICTC opened at RIMS, JNIMS, District Hospitals and CHC's.He further said that HIV and AIDS is no longer a mere health issue but also a social, economic, legal, human rights and even political issue. The sincere efforts of the officials concerned, activists of the state will not be sufficient in tackling the issue; the civil society has to be actively involved. Speaking on the occasion Chief Minister O Ibobi said that there is need for the government and the public to come together to fight HIV and AIDS. We all should work on war footing to eradicate HIV and AIDS and make the state HIV and AIDS free. It is really frightening to learn that around 38,000 people in the state are infected by HIV and AIDS at present. Yet it is again good to learn that the rate has decreased in recent years. The World AIDS Day was also observed by the Progressive People's Organisation at its office in Singjamei. Advocate Y Devdutta and L Jitenkumar, President of Progressive People's Organisation were the Chief Guest and President respectively. The Socio Economic & Environmental Development Organisation (SEEDO) in association with SEEDO Innovators Science Club and SEEDO Science Club also organised the World AIDS Day observation at Takyel Khongbal Maning Leikai. T Roman Meetei, National Youth Awardee and Secretary SEEDO, T Jugin, District Youth Awardee and President SEEDO graced the function as the Chief Guest and President respectively. Talks, lectures, discussion and mass awareness on the issue of HIV and AIDS in Manipur were the main activities of the function. The Coalition Against Drugs and Alcohol (CADA) also organized the World Aids Day observation today. As a part of the observation function a two minute silence was observed in memory of all those who have died of HIV and AIDS. The function was graced by Keisham (o) Taruni Leima, President, CADA, Joy Nongmaithem, Advisor, CADA and Arambam Rabindra, VP, CADA as presidium members. Apunba Nisha Thingba Lup (ANTL), SASO and MNP+ at different venues.